Despite being the creme de la creme of Singapore's landed housing market, GCBs have not been spared the effects of the property cooling measures. THE volume and value of transactions in Good Class Bungalow (GCB) Areas have risen so far this year, though prices continued to soften. Market views are mixed on whether transaction volumes will rise again or fall next year although there is a consensus that prices will keep on dipping at least in the first half. Agents cited a weakening economy and the rising interest rate scenario among other factors. CBRE Research's analysis of caveats data shows that 35 deals in GCB Areas have been sealed so far this year totalling S$755 million, up from 33 deals totalling S$715 million in 2015 and 28 deals (S$626 million) in 2014. The latest transaction to surface in caveats data is Frasers Centrepoint's sale of a freehold bungalow it developed along Holland Park at S$25.5 million or S$1,691 per square foot on land area of 15,080 sq ft. The psf price is 15 per cent lower than the S$1,991 psf at which the property group sold the next-door bungalow two years ago; besides the general GCB price softening, the lower price may also have to do with the fact that the property just sold faces only one road whereas the one sold earlier has a superior orientation with dual road frontage. 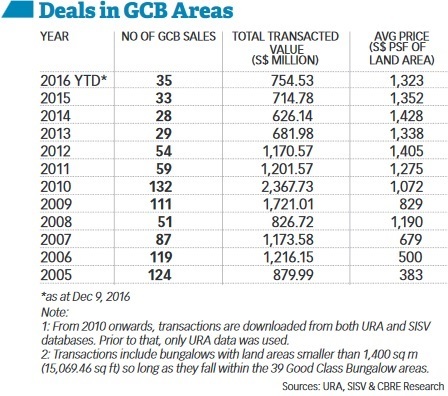 Although this year's GCB sales volumes are the highest in four years, they are a far cry from the recent high in 2012, when 54 bungalows totalling S$1.17 billion changed hands in GCB Areas. Despite being the creme de la creme of Singapore's landed housing market, GCBs have not been spared the effects of the property cooling measures. Tighter loan-to-value limits and the additional buyer's stamp duty for property investors as well as the total debt servicing ratio framework have all eaten into some potential buyers' financial capacity - except for the ultra wealthy set. Only Singapore citizens are allowed to buy landed residential properties in GCB Areas under a policy change in the second half of 2012. CBRE's analysis shows that the average price of GCBs transacted this year is S$1,323 psf on land area, or 2 per cent lower than the S$1,352 psf average price in 2015 - which in turn was a decline of 5.3 per cent from the S$1,428 psf in 2014. However, as Samuel Eyo, managing director of Singapore Christie's International Real Estate (Residential), said, the drop in average psf price for GCB transactions is not due entirely to a decline in property values but also a reflection of the profile of the properties sold this year. For example, a bungalow on a downward-sloping site is deemed less desirable compared with one that is on flat or upward-sloping land. Typically, odd-shaped sites and plots with a small road frontage also command a lower price. The age of the bungalow and its design also have a bearing on its price. After taking into account such factors to arrive at a like-for-like comparison, Realstar Premier Group managing director William Wong estimates that GCB prices today are about 10-15 per cent lower than the last peak in 2013. Prices will probably drop further in first-half 2017 till they are about 15-20 per cent off the peak, he added. Mr Wong also observes that most buyers these days are receptive only to properties in the low S$20 million range for good locations. Those who are less location-sensitive will be looking to pay below S$20 million, he added. CBRE Realty Associates' head of luxury homes, Douglas Wong, noted that the lower GCB prices have boosted sales volumes this year. "While sellers were largely not under pressure, they could have envisaged that the market may weaken further in the near term. "In the coming year, investors will be cautious given more uncertainty around employment, interest rates and the global economy. In addition, the Monetary Authority of Singapore has reiterated that it will keep the cooling measures in place for some time." This will put downward pressure on prices. Sellers may be more motivated to preserve capital and withdraw their properties temporarily from the market - leading to fewer transactions, he argued. Newsman Realty managing director KH Tan also predicts prices will soften again in first-half 2017 with a chance of stabilising in the second half - assuming the economy starts to improve. He also predicts a decline in transaction volumes. "There is not much of good stock available for sale in the market for the next few months. "There have been quite a number of estate sales this year, leaving the market with fewer choice listings as of now." Mr Wong of Realstar on the other hand argues that the number of GCB deals is likely to stay the same or increase next year as the authorities are unlikely to introduce further measures that will be negative for the property market. "As long as we do not head into recession and banks do not further tighten loan approvals, transactions should still be healthy. "Moreover, attractive price levels will entice more buyers to enter the market. Buyers will seek attractive prices to cushion themselves against further price declines. We expect more GCBs which are not in prime locations to be transacted at S$1,000-1,200 psf." Also predicting a pick-up in GCB sales volume in the next 12 months is Mr Eyo. GCB buying this year was supported by families with old money, as well as the nouveau riche and foreigners who have become Singaporeans. Along Queen Astrid Park, a grand daughter of billionaire paint tycoon Goh Cheng Liang bought a bungalow for S$44.5 million or S$1,271 psf; the 35,011 sq ft site has potential for subdivision into two smaller GCB plots. Yun Nam Hair Care boss Andy Chua picked up a property along Brizay Park off Old Holland Road for S$33 million or S$1,108 psf - next to a property he already owns. Zhang Yong, the founder of the Sichuan HaiDiLao steamboat chain from China and now a Singapore citizen, acquired a bungalow on Gallop Road for S$27 million. Mr Eyo observed that GCB sellers this year mostly were not living in the properties they sold. "Some are in their 60s and 70s; they could be downsizing. There was at least one divorce case. There were also a few estate sales. Buyers are mostly in their 40s and 50s." GCBs are the most prestigious type of landed housing in Singapore because of the planning constraints to preserve their exclusivity and low-rise character. The Urban Redevelopment Authority has designated 39 locations on mainland Singapore as GCB Areas. Typically, GCBs have a minimum land area of 1,400 square metres (15,069 sq ft); however, when GCB Areas were gazetted in 1980, they included some smaller existing sites. These are still considered GCBs as they would be bound by the other GCB planning rules if they were to be redeveloped. For instance, such plots cannot be further subdivided and they cannot be built more than two storeys high (plus an attic and a basement).